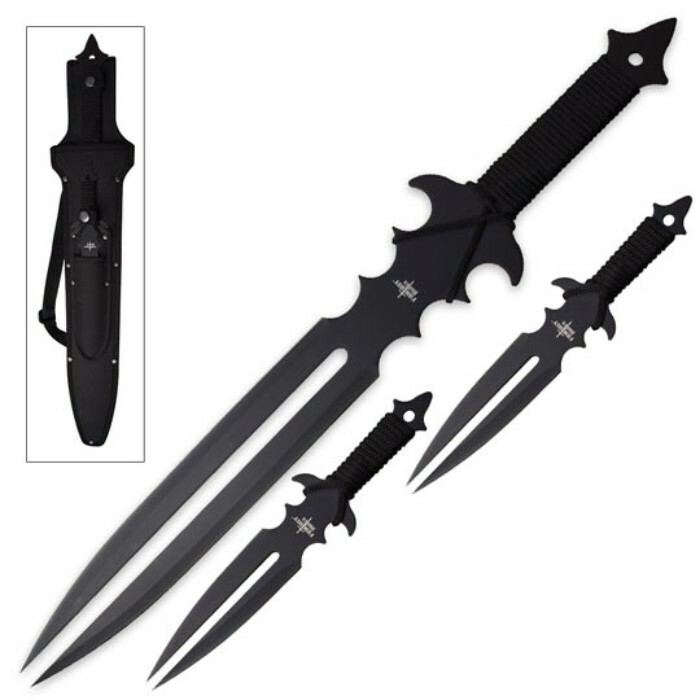 Fantasy Master Fang Clan 3-Piece Short Sword and Twin Dagger Set with Nylon Belt / Shoulder Sheath | BUDK.com - Knives & Swords At The Lowest Prices! Whether you're slaying goblin hordes in brutal open combat, or stealthily assassinating the Orc King as he slumbers in his bed chamber, Fantasy Master's distinctive "Fang Clan" Sword and Dagger Set has the versatility and capability to see you through any kind of mission. 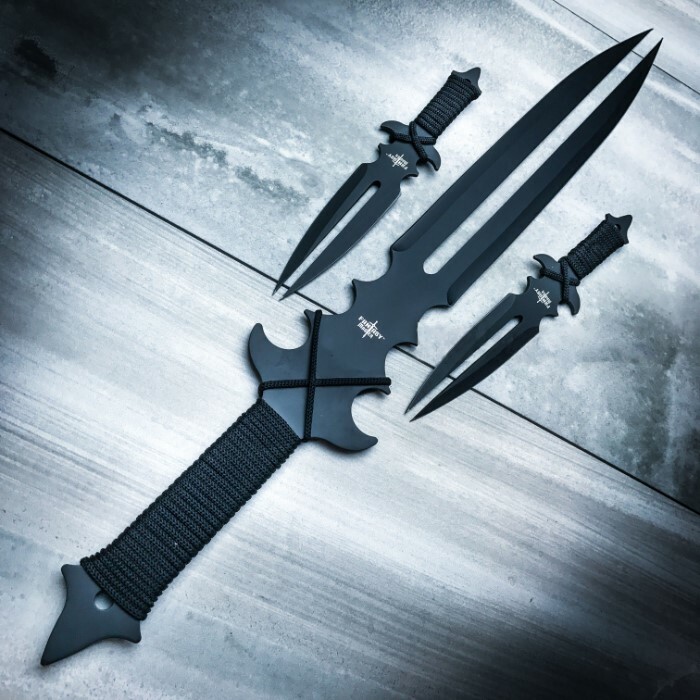 With its impressive 22 1/2" short sword and easy-to-conceal twin daggers, the Fang Clan offers big, bold power and subtle, discreet effectiveness in a single versatile cutlery set. Each piece in this treacherous trio boasts a sinister, threatening look, backed up by plenty of vicious, deathly potent bite. Each is fashioned from a single piece of rugged, black coated stainless steel, and all three feature the same uniquely wicked split blade profile. 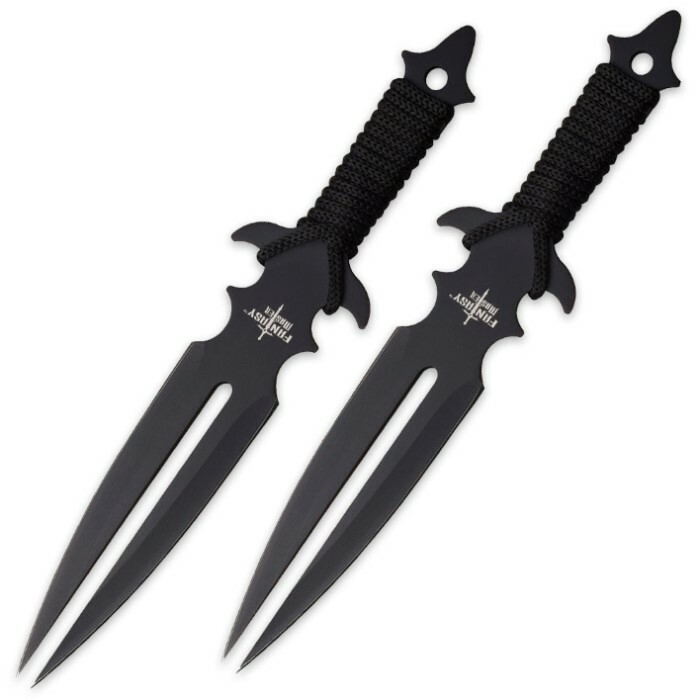 The twin-pronged blades are double edged and razor sharp, and the distinctive edge division makes them appear menacingly fang-like, hence the set's "Fang Clan" moniker. Wrapped in black cord, each handle is easy to grip and bookended by a devilish horn-like guard and eerie pointed pommel with lanyard hole. 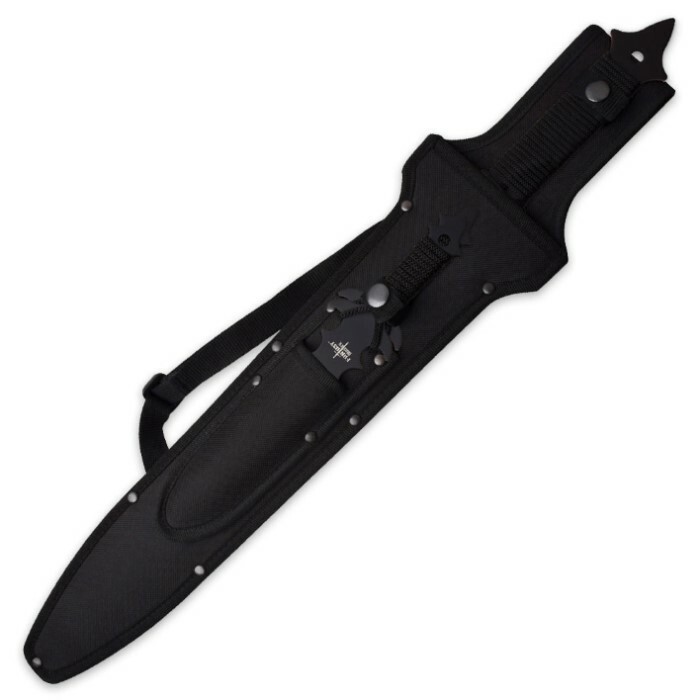 The included black nylon belt/shoulder sheath conveniently houses the sword and both daggers for easy transport and storage. Take on the large, take on the small and every foe in between - with the incredible versatility and awesome might of Fantasy Master's Fang Clan Sword and Dagger Set by your side, you can do it all! With their frightening designs, however, a single glimpse at any of the brutal black beauties in this terrifying trio may be all it takes to scatter your enemies like dry leaves in the wind! Looks cool, blade had a decent edge but too much vibration if you strike something. Good for intimidation or show piece but not for practical use.